Caught in the Web of Words by K. M. Elisabeth Murray, granddaughter of James, is an indispensable read for anyone interested in the OED or the history of lexicography. It was considered by Anthony Burgess to be one of the best biographies of the 20th century. My thanks to the authors: K. M. Elisabeth Murray, Frederick Bodmer, Steven Pinker, Andrew Robinson, Sara Baume, Kory Stamper, and Guy Deutscher. Some of these books and authors have featured before. You can browse the full archive of book spine poems, which also includes links to other people’s. Or join in, if you take a notion. Update: This effort caught the eye of the good people at the OED, who interviewed me about language, dictionaries, and book spine poetry. This entry was posted on Thursday, April 19th, 2018 at 10:47 am and is filed under books, lexicography, poetry, wordplay. You can follow any responses to this entry through the RSS 2.0 feed. You can leave a response, or trackback from your own site. Language as is, is a colored glass which shows real in an indirect method,shows other than what is. This is beautiful, Stan. Your line-breaks within the last three book titles deepens the poetic meaning. Thank you, Katherine. I didn’t want them to be gratuitous, but I think they work OK.
Love it! If I had the knack you do, I’d put one together! Try it! All you need are two or three that go together. Sometimes that’s enough. Lovely. Maybe my fave of your word-spine poems yet. Thanks, Elizabeth; I’m glad you like it. I first saw it done by the artist Nina Katchadourian, in her project ‘Sorted Books’. It’s a fun way to spend time rummaging around your bookshelves. Thank you, and welcome to the game! 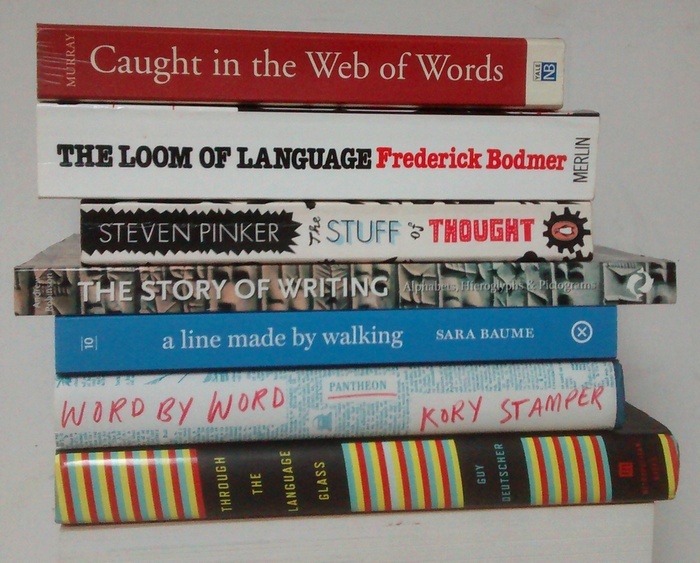 I like your book spine poem, and I hope you took a photo of it for posterity.